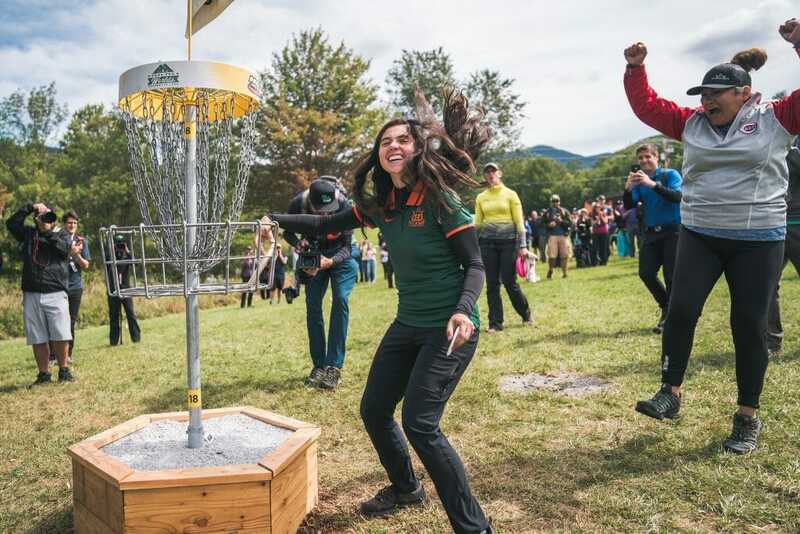 After Paige Bjerkaas dropped in her final, PDGA Professional World Championship-clinching putt into the basket of hole 18 on Fox Run Meadows, she let out a few jumps of pure, overwhelming elation. She was then immediately rushed by her caddy, who wrapped her in a hug, and joined her in delirious bouncing. The UDisc Live scorer from the lead card joined them in a group hug shortly thereafter, the three embracing and sharing tears of joy while a forest of cameras surrounded the new world champion. Not many disc golfers celebrate with their caddy and official scorer the way Bjerkaas did, but then, not many get to have their mother and father as their caddy and scorer. 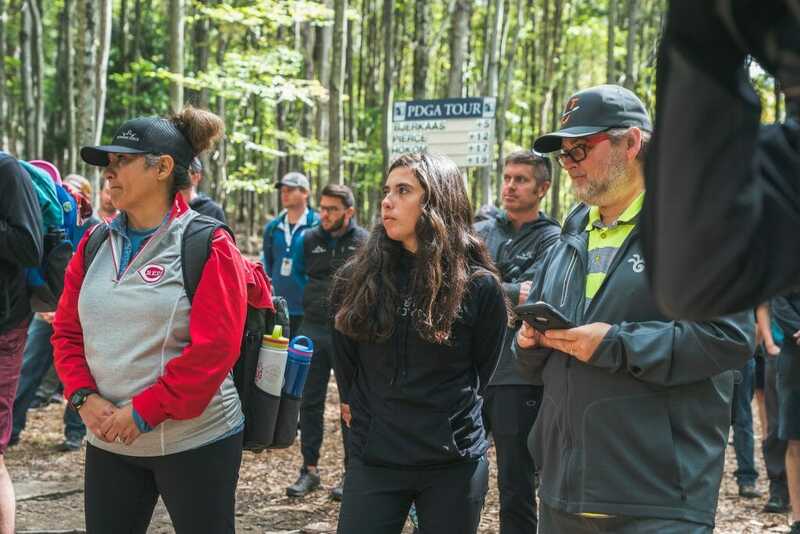 Bjerkaas’ mother, Noemi, was her caddy the entire week at Smugglers’ Notch Resort, and her father, Doug, was her card’s UDisc scorer for every round. Bjerkaas had her family as an immediate support system as she played for a world title, and according to Bjerkaas, it made a world of difference. 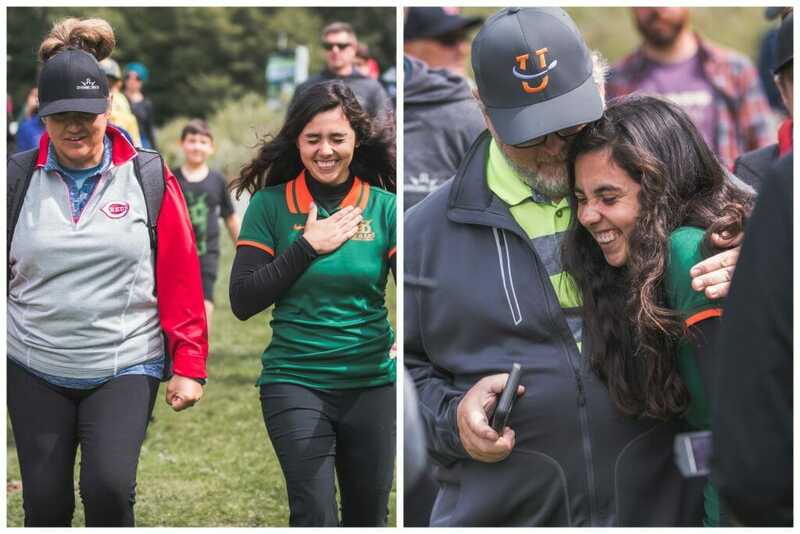 Noemi and Doug both offered moments of comfort to Bjerkaas throughout her play at Pro Worlds, taking turns to hug and whisper encouragement to their daughter. They were most supportive when Bjerkaas had her toughest round — her 5-over par round four. They were there to make sure Bjerkaas didn’t get too down on herself when her throws went out of bounds, or her putts didn’t go in. In a sport that can make you feel very alone on the course when you’re struggling, Bjerkaas never had to endure that. Bjerkaas noted that her parents always knew when to provide the words of encouragement, and when to give her space, and it seemed her parents knew exactly what to say to keep frustrating shots from turning into frustrating rounds. “I was telling her, ‘One bad shot doesn’t ruin your whole round. Just try to recover, keep the mistakes to a minimum and don’t look back, look forward,’” said Noemi. As her daughter’s caddy, she was there for every shot. Doug was a bit further back, but he too was there when Paige needed. “I kept telling her, ‘Just one hole at a time, just one shot at a time,’” he said. For Noemi, the first to join her daughter in celebration after the win, it was beyond even that. “We are just so elated. It’s like I won!” she laughed. Doug and Noemi Bjerkaas had front row seats to watch their daughter become a world champ, and Paige Bjerkaas played the best golf of her career with her parents right next to her. It resulted in a highlight that the three of them will surely always remember. Daniel Prentice is an Ultiworld Disc Golf reporter from Tallahassee, Florida. Follow him on Twitter: @danielprent. Comments on "A Bjerkaas Family Worlds Win"